If you’re looking for professional hair styling in Darlington – you’ve found us! As well as a reputation for a friendly reception and top class styling, Clinic 36 offers everything you might want, from the latest cuts to perming and hair colouring treatments. We cater for all ages and all styles and are always happy to offer advice and guidance if you’re looking for something creative or innovative for a wedding or other special event. 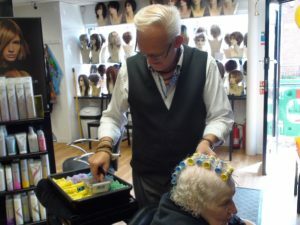 Our senior stylists are all professionally qualified hairdressers so you have total peace of mind that whatever you want will be delivered with the utmost care and attention. We make it our business to keep up with the latest trends, while maintaining our traditional standards, and we have a superb reputation among the hair salons in Darlington. At Clinic 36 we have years of experience in designing stunning bridal hair styles. Why not take advantage of our specially tailored package for the bride, bridesmaids, mothers – even the groom! Please call 01325 463 836 to arrange a no-obligation wedding hair style planning meeting.